Dr. Gerardo Lopez-Mena, vice president of medical affairs at DHR Health, conducts a meeting at DHR Health. Lopez-Mena received the Young Physician of the Year Award from the National Hispanic Medical Association. Two physicians from Edinburg-based Doctors Hospital at Renaissance were awarded Young Physician of the Year awards by the National Hispanic Medical Association, according to a news release. Gerardo Lopez-Mena, vice president of medical affairs at DHR Health, and Michael Martinez, a bariatric surgeon at the DHR Health Bariatric and Metabolic Institute, were among the 12 recipients of the award from NHMA. 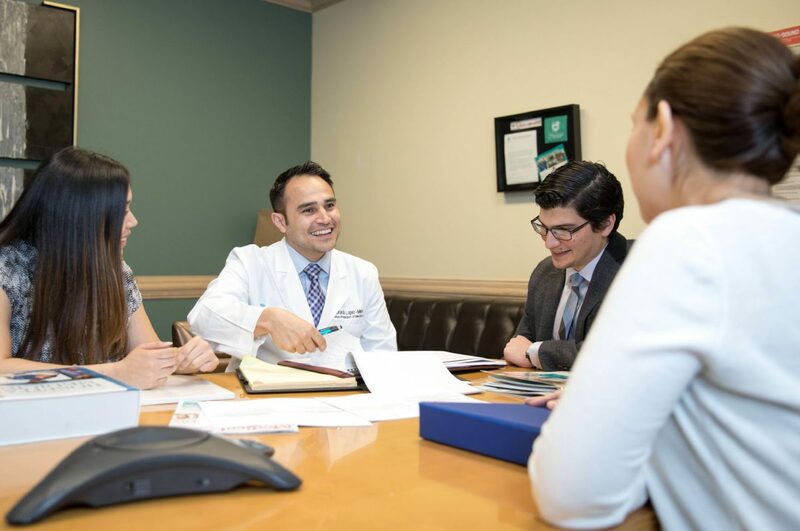 The association is a nonprofit organization that aims to empower Hispanic doctors to become leaders and work to eliminate health disparities between the Hispanic and broader nationwide population. 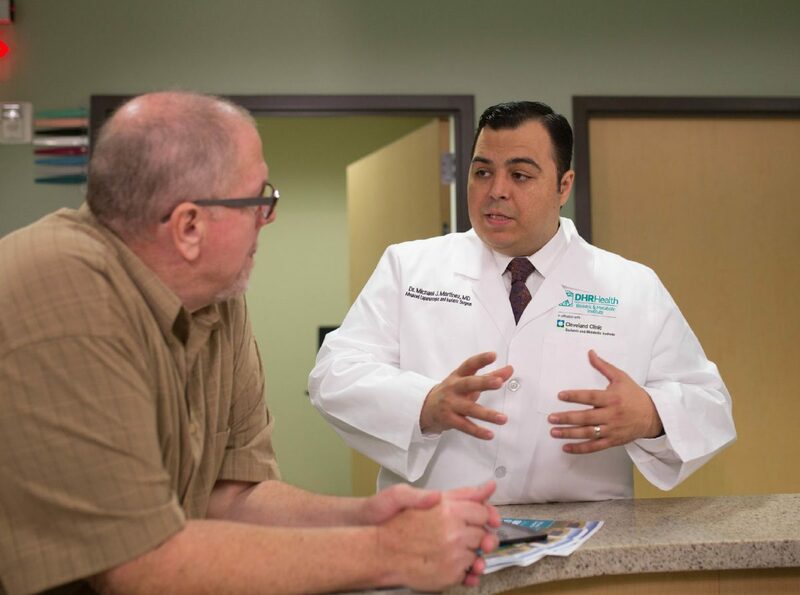 Dr. Michael Martinez, bariatric surgeon at the DHR Health Bariatric and Metabolic Institute, speaks with a patient. Martinez received the Young Physician of the Year Award from the National Hispanic Medical Association. Originally from El Monte, California, Lopez-Mena received his medical degree from Albert Einstein College of Medicine in New York City in 2011 and then completed his residency at Johns Hopkins Bayview Medical Center in Baltimore, Maryland. It was there that he founded Embajadores de Salud de la Comunidad (Ambassadors of Community Health). The program aims to use partnerships between health and faith organizations to educate the Hispanic community about important health topics. Lopez-Mena began working at DHR Health as physician executive of community engagement before joining medical affairs and the Renaissance Hospitalist group. Martinez, on the other hand, is an Edinburg native who left the Rio Grande Valley to attend Princeton University in New Jersey and then received his medical degree from Yale School of Medicine in New Haven, Connecticut. He completed his residency at Baylor Scott & White in Temple, Texas, and then completed fellowship training in advanced laparoscopic and bariatric surgery at the University of South Florida in Tampa. Currently, in addition to being a bariatric surgeon, he is a clinical associate professor in general surgery at the University of Texas Rio Grande Valley. NHMA selects two physicians from each of their six regions for the award and Lopez-Mena and Martinez were the two chosen from the Southwest Region. Their awards will be presented at the 22nd annual NHMA Conference on March 22 in Washington, D.C.